So we now have this fancy new laser available at Friendship, but the big questions is – does it really work? Despite the extensive research that validates its healing abilities, I was still skeptical. That is until I witnessed what it did for my patient Nietzsche. 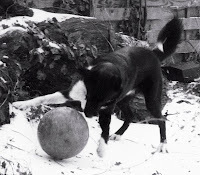 Nietzsche is a 14-year-old border collie I saw this past fall for a urinary tract infection. During this exam his owner and I discussed management options for the severe arthritis in his hips, which had become almost crippling for him. He was incredibly weak in his hind limbs with an extremely decreased range of motion of the hip joints and severe muscle wasting. Nietzsche’s muscle atrophy was so severe he couldn’t rise without assistance and tired very quickly once he was walking. Despite his chronic pain he still loved to eat and looked forward to going on his walks, regardless of how short they had to be. We had him on two pain medications to help keep him comfortable but he was still very handicapped. When the laser arrived I immediately thought of Nietzsche and wondered if this could help him. His owner was interested in trying so we started him on a treatment protocol of twice weekly sessions. The first few sessions were relatively unimpressive. The literature says it can take anywhere from 3 to 20 sessions to notice an improvement a chronic condition like Nietzsche’s. Around the time of sessions 3 and 4, he started to have a hard time. Not because of the laser therapy but his age was catching up with him and he seemed more depressed at home. After a long talk about quality of life we decided to see how he did at home after session five. He seemed to do a little better so we decided to keep going. Everyone was amazed after Nietzsche’s seventh session when he pranced through the treatment area at the hospital. I called his owner immediately to report this exciting development. He too had noticed a difference: in fact, on the previous evening, he and Nietzsche had gone on their longest walk in months. That was a few weeks ago and now Nietzsche’s owner reports that he has better balance, his attitude is back to normal (stubborn and opinionated) and this past weekend he even thought about chasing a squirrel! Now that Nietzsche has a break from the chronic joint pain that dominated his life, he is able to focus on things that make him happy – like going on walks with his owner and thinking about squirrels.